commendation Archives - Touch Display Research, Inc.
I’m back from SID 2013 Displayweek conference with an award, given to me by SID president Brian Berkeley for my volunteer work at the SID Bay Area’s first one-day conference in January—”Display and Touch Technologies of the Future.” I really appreciate it! It was lots of work to put together a conference like that. Geoff Walker, the former Bay Area chapter chair, came to me and other volunteers last August, and asked us to organize the first one-day conference. After over four months of hard work, the conference was successfully held on January 16th, 2013. It was overwhelmingly successful with 160 attendees. We had to apologize to another twenty-five people on the waiting list, because the venue was not spacious enough for the extra crowd. To all the volunteer team, this award is also for you: Geoff, Rashmi, John, Joe, Steve, Cheng-wei, Catherine, Lauren. Thank you and cheers! 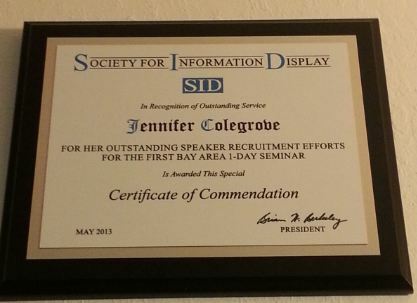 This entry was posted in Company News, Displays and tagged commendation, SID, touch display research on May 31, 2013 by jennycolegrove.